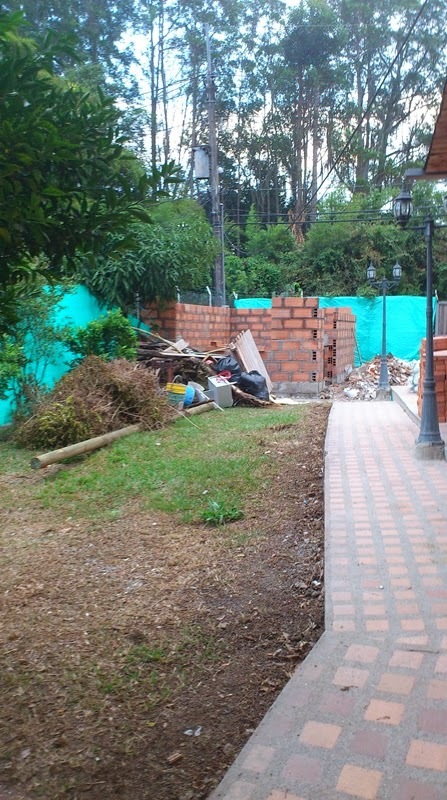 An Englishman in Colombia: Progress?...Not sure! Yesterday morning I had my three monthly BP Clinic, and everything was fine, it is possible that our new Health Service Provider is going to take over the existing Clinic, in which case, things will continue as before, just under a different name, if not, we will have to go into town, we should know next week. In the afternoon, we Marcela, Pépe and myself, took a man (Oscar) up to the finca to install our gas water heater, he asked me to change the regulator and piping I had bought, which he said was fine for use in the kitchen, but he wanted a stronger regulator and yellow, natural gas pipe, fitted to the heater, due to the extra pressure. Back home, and Oscar on his way, we shot up to see John No.2 at the Kitchen shop, he appeared half-cut to me, but Marcela said he was covering up the fact that he was ashamed of the problems, he has promised they will be resolved, we will just have to wait and see. Then it was to the Gas fittings shop, and bought a new regulator, and the yellow tubing, which the shop, compression fitted, to stop any chance of it popping apart. From there we went round to the Shower door shop, and selected the glass doors we want, or in the case of the downstairs door, no choice, because the walls are so far out of true, that we are going to have to have sliding glass doors in a frame, and the frame will then have a trim to fill in the wonky wall space. Marcela's shower room door (en suite) will be a swing door. Whilst there, John said that he needed the bricks for the BBQ by today, so that was one for the list, then he showed us his handiwork with the land drain, the reason it has not yet been backfilled, is that the sealing paint, had not yet dried. This morning we had an appointment with an agent of our new Health Care Provider, to sign up for the supplementary plan, which gives me the same cover I have at present, that took longer than we anticipated. We then headed home for lunch, and we then hitched up the trailer, and Marcela came with me to buy the bricks, John had said to buy 300, the BBQ is going to be just over 2m x 0.6m with a one metre grill, another area for sancocho, and the third for a work area to put plate, implements etc. three men formed a chain and loaded the trailer, there looked an awful lot for the BBQ... we then set off, and at the bottom of our road, Marcela decamped to catch a bus back to Bello, and I headed slowly up the hill, however I think the load was at maximum capacity, and I made one error, and that was to pull over and stop, to allow traffic to pass me, the weight of the trailer then caused wheel spin, I tried 4x4, but I then started to get smoke, so I ditched that idea, and ended up reversing down the road, until I caught an area without any gravel on the road, and off I went again. At the house I parked outside the neighbours, John was not at work, Ramillo grabbed his wheel barrow, and we kept filling and emptying it, until the trailer was empty, but give the man his due. Ramillo did all the pushing of the barrow, he is certainly strong for a man of his size. 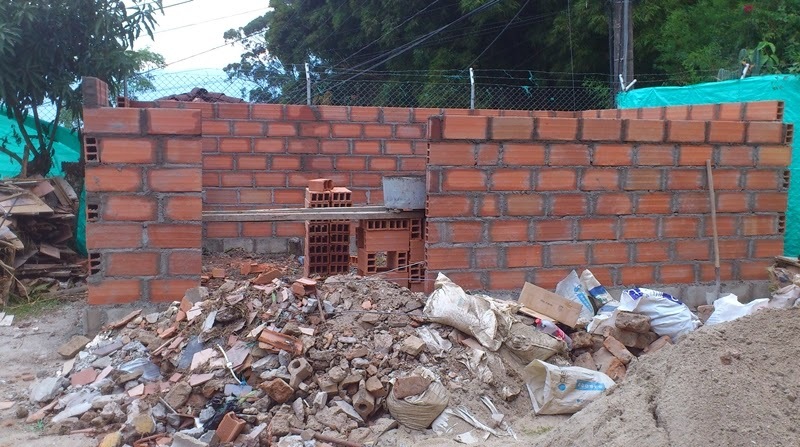 Ramillo thinks John has asked for enough bricks for two BBQs, Oh well! I can always use them to make a brick dog kennel, or borders for plants. Once that job was completed, I took the cartons of my clothes, I had in the car, into the house and emptied them into plastic sacks. After which, I then changed over the Regulator and pipe for the water heater, I didn't use tape to seal the joints, I used 'Stop-Gas', it is the equivalent of the plumbers liquid used to replace silicon tape, and makes life a lot easier, I don't like working with gas, but the only other option here is to put it in the hands of Odd Job, and I rather do it myself. Then the intention was to fit the piping for the gas to the kitchen, for both the oven and hob, I took the oven out of the unit, to find that there were no parts to connect it to the gas piping, that went for the both units, I don't understand the mentality of businesses here, but apparently, they supply the kitchen, any plumbing, electrical work, or gas, is down to the householder to arrange, which sort of bumps up what otherwise was a reasonable price. So I am left with a nice looking oven and hob, that until I can get the parts, I can't connect up or use. However, I have soldered up the copper pipe that will run outside from the kitchen to the tool shed, where the gas cylinders will be housed, that was not a problem, the intention was to take the copper pipe inside, and then branch out to the appliances, but due to the close locality to the kitchen uints, that is not viable, so I have the orange tubing going from inside, out through the exterior wall, and connecting to the copper pipe. Now I just hope my soldering is up to standard, at least with water you know if there is a leak, with gas, you wait for the boom!! That done, light was starting to fade, so I packed up, whilst doing so, took a couple of photos of the workshop progress, I am pleasantly pleased with the size, I thought it would be smaller. The lawn is looking a bit sad! 6m x 3.5m not a bad size, and plenty of outside space! That done I made my way home, and will be out first thing in the morning for a full days work... well, if I can hack it!